There’s something about cruising up to the Jet Blue terminal on the very Disney-like monorail that is the AirTrain at JFK Airport here in New York that makes you feel like you were leaving one city and entering another. A very busy city, at that. 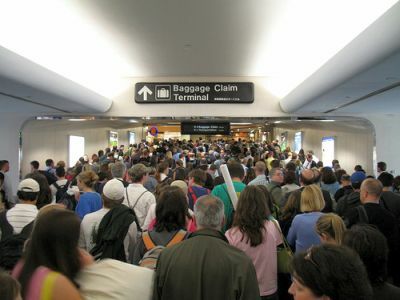 Which made me wonder: What is the world’s busiest airport? I admit I’ve been a little wonkish lately (perhaps as a result of not being on a recent enough trip), but I have to admit, this question came to me naturally (unlike, say, some recent forays into the number of Swedes that visit Thailand, or the number of Alabamians with passports). So here it goes. The Airports Council International (“ACI”) just reported their numbers for air passenger traffic for 2009. Overall, the number of flyers worldwide actually declined by 2.7% to 4.4 billion, and the number of aircraft movements (takeoff and landings) were down 5.5% to 63.9 million. And the busiest airport? Topping the list at #1 was Hartsfield-Jackson Atlanta International Airport with 87,993,451 passengers, followed by London Heathrow Airport at 66,037,578. Rising to #3 in 2009 was Beijing Capital International Airport with 65,329,851 passengers, followed by last year’s third place, Chicago O’Hare International Airport at 64,397,891. ACI’s report can be found here (.pdf fomat).